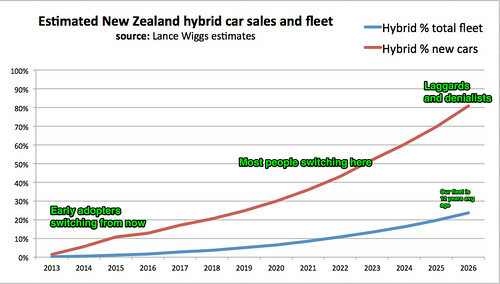 Hybrid sales and fleet projections NZ, originally uploaded by LanceWiggs. This is a very rough estimate, and there are plenty of ways it can be improved. In 2011 we saw under 1000 NZ new hybrid car registrations, out of a total of 64,000. That’s a small share of the total car imports of 150,000, with 95% of the remainder used imports from Japan. The otherwise excellent NZTA does not break down those imports by model unfortunately. Those statistics could be improved just by showing the breakdown of hybrid and hybrid/electric and electric vehicles, as I suspect the number of model types would create a book-length statistical summary. A quick search and look at Wikipedia shows that in 2009 hybrids represented 10% of all Japanese new vehicle, rising to 16% in 2011, despite the effect of the Tsunami. 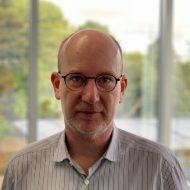 Given our own tighter emission rules, and given that New Zealand imports 95% of our second hand imports from Japan, we can expect to see that rise in share flow through to New Zealand over the next years. Meanwhile manufacturers are making more hybrid and electric models, and doing so increasingly efficiently (cheaply). Consumers are increasingly aware that they can, like taxi drivers, save large amounts of money by switching, while they are also environmentally savvier. The Prius has dominated sales to date, and old and high milage ones are still in great condition, assuaging early fears about battery life. These are the factors behind the projection, which as I said is rough. I see that the switch will happen, and it’s just a matter of when. At some stage, I have 30% in 2020 and 60% in 2024, the hybrid share of new vehicles into NZ will switch to become a majority. Our fleet, with average age of 12 years, will take a lot longer to migrate, but by 2031 we’ll be half hybrid/electric. And that’s good. If you are worried about losing performance – just take a look at Tesla or WrightSpeed. Electricity is a great provider of torque. Is New Zealand’s Research and Development really that low? Our company switched to a hybrid fleet of vehicles recently (we’re using the Honda Insight) for several reasons including cost savings as well as projecting an image that matched our company’s philosophies. But personally, I still have doubts about whether today’s hybrids are the way to go. There are many diesel-powered small cars that have similar or better fuel efficiency than hybrids, and these also don’t have the problem of disposing of batteries built from old technology. There are more and more pure-electric vehicles coming to market but these all suffer from the same issues of short run times and long charge times. But then there are newer hybrid-technologies coming through like the Jaguar C-X75 that is electric-driven but uses diesel jet-turbines to keep the batteries charged. And don’t forget about fuel cell technology that uses Hydrogen as the “fuel”. Hopefully, in 12 years time we won’t be talking about hybrid cars as we know them today. For a country like NZ that has an abundance (75%?) of renewable energy, it puts us in a great position to go pure electric and leave the dirty fossil fuels behind us for good. Having just rented a Vauxhall electric for the day from ZipCar in London, all I can say is bring it on. The new electric cars are a lot of fun to drive. And the use case for small journeys around home is excellent. I wonder how we could factor for second-hand Japanese imports better in your model above. Maybe look at hybrid sales trends in Japan and then factor in a delay for when that stock starts to arrive in NZ?